The full schedule has just gone live for the October 5th New York Academy of Medicine Festival of Medical History and Arts, co-curated by Morbid Anatomy and Lawrence Weschler, former director of NYU Institute for the Humanities/Wonder Cabinet series and author of the amazing Mr. Wilson and his Cabinet of Wonders. Full lineup follows; all talks are free and open to the public, with no registration needed; classes and after party do require tickets; follow the links for more. Hope very much to see you there! Art writer and curator Lawrence Weschler (Mr. Wilson and his Cabinet of Wonders) discourses on Rembrandt’s Anatomy Lesson and then engages essayist Bill Hayes in a conversation about the legendary anatomist Henry Gray (the subject of his book Gray’s Anatomy). Starting out from a consideration of the exquisitely agonizing last hours of the French King Louis XIII (as evoked, at exquisite length, by Roberto Rossellini in his film The Taking of Power of Louis XIV), Hunter College historian Dániel Margócsy discusses what once passed for the height of medical care (bloodletting, stool analysis, leeches and the like) and compares it with our current practices. One day in 2005, Jane Gauntlett, a 25-year-old trainee theater producer from North London was brutally attacked while bicycling in broad daylight, robbed, and left for dead, with massive head injuries, in the gutter. She survived, recovered (albeit plagued by several grand mal seizures a week), and went on to develop a highly imaginative way of conveying the actual felt experience of such seizures (and other such medical episodes) to audiences throughout the world. 4:00 PM – 5:30 PMFollowing the screening of a new 15 minute documentary which filmmaker Bill Morrison culled from a box of over five hours of archival super-8 reels which Sacks himself shot at the time of the uncanny awakening of his wardful of postencephalytically entranced patients back in 1969 (set to music by Philip Glass), Oliver Sacks himself will discuss those days with curator Weschler, focusing in particular on the benign influence of two powerful mentors who held sway over his life during that period, the Soviet neuropsychologist A. R. Luria and the English poet W. H. Auden. Chicago artist Riva Lehrer has little business even being alive and may well be one of the last survivors of her original cohort, babies born with spina bifida back in 1958. Though having had to navigate life in foreshortened, corkscrewed body, regularly subject to harrowing complications, she has flourished not only as a superb portraitist but also as a highly prized lecturer in anatomy at the School of the Art Institute of Chicago. Her talk will start out from the unsettling experience last year of coming upon a fetal specimen very like herself on display at the Mutter Museum in Philadelphia. La Portentosa Vida de la Muerte (The Astounding Life of Death) is a rare, fantastically illustrated 18th century Mexican book in which author Joaquin Bolaños recounts, in an exuberant baroque style, the many adventures of Death, from her humble beginnings in the Garden of Eden, where she is said to have been born from Adam’s Sin and Eve’s Guilt, to her dramatic destruction on Judgment Day. The protagonist of the story is referred to as “The Empress of the Sepulchers,” and her deeds are recounted in a series of disjointed chapters. Banned by the Inquisition, the book and the engravings that illustrate it had a discernible influence on Mexico’s popular representations of death. This lecture will discuss this influential book, focusing on cultural attitudes towards death in Mexico from pre-Columbian times to the present day, touching on subjects such as Day of the Dead, rural Mexican post-mortem photography of the 1940s and ’50s, and the contemporary worshiping of Santa Muerte. The World’s Fairs that captivated the imagination of turn-of-the-century America were notable not only for their significant inventions (the telephone, the Ferris Wheel, cotton candy), but for their lavish anthropological exhibitions, which included large ethnographic enclosures featuring “exotic” natives from around the globe, living in recreated habitats and performing traditional acts for the benefit of thousands of curious, mostly Anglo-Saxon spectators. These “human zoos”, descendants of the villages nègres of Victorian colonial expositions, offered ethnographers a rare opportunity to observe, measure, and analyze other races—and their conclusions lent inspiration and encouragement to practitioners of the new discipline of eugenics, which soon saw field researchers traveling to the freak shows at Coney Island, that ne plus ultra of human zoos. This talk surveys early modern efforts to correctly visualize the human body. It brings into conversation Descartes’ philosophical musings on the nature of representation with the vibrant anatomical culture of the contemporary Dutch Republic, where the French philosopher resided for much of his adult life. For example, the physician Frederik Ruysch, famous for his macabre tableaus, worked throughout his life to produce a method of representation that was immune to Cartesian skepticism over reliability of images. The talk examines in detail Ruysch’s working methods with engraved illustrations and anatomical preparations, and explains why Ruysch hoped that these imaging techniques might offer a faithful representation of human life. Medical libraries such as the New York Academy of Medicine’s offer ready access to a motherlode of “invisible literature,” the SF novelist J. G. Ballard’s term for medical textbooks, scientific journals, technical manuals, and other gray matter. Although it comprises a veritable galaxy in the universe of print media, invisible literature is nowhere to be found in general-interest bookstores, and is never reviewed in mainstream book pages for the simple fact that no one, not even the specialists who are its intended audience, thinks of this stuff as literature in the literary sense of the word. But what if we did? Our understanding of the brain depends in large part on the tools that were invented to look at it. Confronted with an undifferentiated mass of gray, students of the nervous system have had to get clever and probe it in ingenious ways. This talk will present whirlwind survey beginning with the earliest attempts to interact with this extraordinarily complex organ, up to the seminal technical innovations in the late 19th century that launched the modern field. This talk surveys a spectrum of artistic and museological dioramas, waxworks, and post-mortem photographic practices, and the hermetic, frozen worlds each offer to the viewer. There is something profoundly fetishistic, and mildly necrophilic, at the heart of the diorama, an apparent desire to encapsulate and reanimate those items on display. This paradoxical tension between preservation and regeneration seems germane to the 19th-century imagination in general, the moment at which many of the visual practices Herzog will discuss came into being. And while the diorama in particular is driven by a certain pedagogical directive, this talk will suggest that their lessons are more ambiguous than their creators likely imagined, and offer uncanny insights into our contemporary condition. This illustrated presentation will examine the art and history of the wax anatomical models of the “Museo Zoologico La Specola” in Florence, Italy. Over 2,000 wax models of human anatomy were created by the museum’s “Wax Modeling Workshop” from the mid 18th to early 19th century, and the products of their labor are considered by many to be the finest anatomical waxworks in the world. This presentation will address how and why these anatomical masterpieces were created, the artists and anatomists who created them, and the place of these collections in the history of anatomical art. The wax anatomical models of Bologna, which pre-date those of “La Specola,” and the dissectible papier-mâché anatomical models by Dr. Louis Auzoux will also be discussed. From the beginning, Charles Willson Peale’s museum expressed a clear message of collection presentation arranged along the lines of the latest available scientific principles. Peale and his talented progeny were some of the last of the 18th century naturalists, when early professional scientists were just emerging. The very progressive educational and scientific approach of the Peales includes many interesting links with early evolutionist ideas and modern medicine. Between 1920 and 1960, as the technologies of industrial modernity proliferated, the public was gripped by a technomania for rays, beams, and waves. Electromagnetism, radioactivity, radio waves, X-rays, ultra-violet rays, infra-red rays, cosmic rays, gamma rays, brain waves–and all sorts of exotic, miraculous, and terrible rays soon to be discovered or invented–received effulgent representation in illustrated science-fiction, movies, comic books, and other entertainments. Popular science writer Fritz Kahn was among those enchanted with rays, beams, and waves, and eager to cater to his readers’ enchantment with the same. 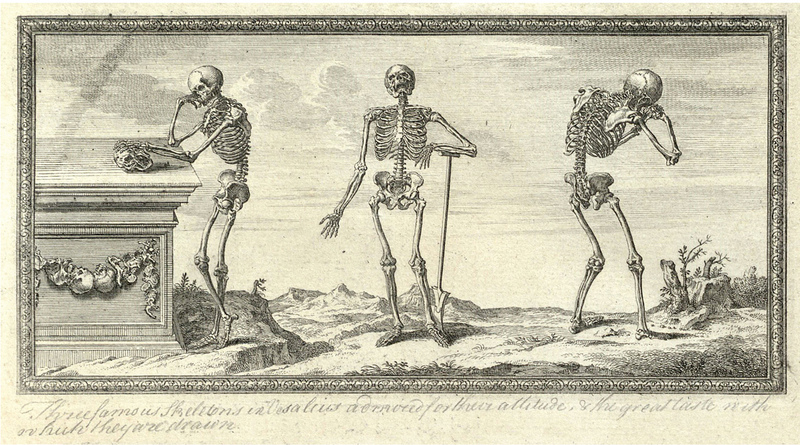 This talk will explore the use of such imagery in medical illustration of the time. Colin Dickey will tell the story of how the skulls of several famous musicians, artists, and writers were stolen in the early nineteenth century. Between 1790 and 1840, the skulls (or parts of thereof) of Mozart, Beethoven, Haydn, Goya, and others were stolen by a strange mix of phrenologists and other collectors; Dickey will discuss these stories and the motivations behind these thefts. Cultural anthropologist Ernest Becker suggested that the capacity to understand one’s mortality and the ways humans deal with this awareness could explain behaviors ranging from genocide to altruism. Terror Management Theory (TMT) was developed based on Becker’s work and provides a scientific framework for testing his idea about death as a core motivator of human behavior. Over the last 25 years researchers have conducted hundreds of studies to test hypothesis derived from TMT. These studies have examined how mortality salience influences behaviors ranging from aggression and stereotyping to creativity and sexuality. This lecture will introduce the theory and discuss experiments that have been conducted to test its tenets. Due to their macabre nature, “anthropodermic bibliopegy”—or books bound in human skin—have been treated as curios and overlooked as objects of serious study. Most were created as examples or warnings, but some specific titles were sought out to be rebound in human leather by faddish collectors. Daniel K. Smith has examined, photographed and researched examples at Philadelphia’s Mütter Museum, The Grolier Club and The John Hay Library at Brown University, and found fascinating histories that illuminate worlds as diverse as grave-robbing, the King of Belgium, New England highwaymen, and 19th-century Parisian aristocracy. Modern scientific dissection and illustrations commenced in the Renaissance. Basic anatomical dissection, illustration and knowledge are still fundamental in many fields such as evolutionary biology, surgery, quality medical schools, and forensic science. In today’s workshop, we will dissect and draw a Didelphis virginiana–the North American opossum–a “living fossil” whose anatomy has remained virtually unchanged over the past 70 million years; this creature is considered to be a good model for a basal–i.e. early or original–mammal. Many comparative skeletal materials will be available for examination and illustration, and additional specimens may also be available. Gloves, scalpels and probes will be provided. Marie Dauenheimer, medical illustrator (and instructor of this afternoon’s carbon dust workshop), will assist with this workshop. In this class, students will learn the techniques of woodcuts and linocuts by creating a copy of one of Hans Holbein’s prints from the Dance of Death series. The class will follow the entire process from beginning to end: drafting a copy of the image, either a fragment or whole; transfer of the image to a linoleum block; cutting the image; printing the image on paper. Students will leave class with their own finished Dance of Death linocut and the skills to produce their own pieces in the future. Using animal and human anatomy as a jumping off point, this course will look at the ground-level, first principles of drawing as representation. Focusing mainly on mammal anatomy, we’ll look at the basic shared forms between humans and other animals, how these forms dictate movement, and how to express those forms. Carbon dust is a technique perfected by medical artist Max Brodel, at the Johns Hopkins University School of Medicine, in the late 19th century. This technique–which, until the digital age, was an essential component of medical illustration education–allows the artist to create luminous, textural, three-dimensional drawings by layering carbon dust on prepared paper. Today’s one-day intensive workshop will teach students the use of this all but forgotten medium, and guide each student in the creation of a finished work based on real anatomical specimens supplied by the instructor. The workshop will also include an historical lecture placing carbon dust drawings in the context of the history of anatomical and medical art. The instructor will provide all materials necessary for this workshop, and will also share finished carbon dust drawings. Festival of Medical History and the Arts After-Party with open bar, medical-inspired tunes by DJ Friese Undine, and cartoons from the NLM's collections spanning the silent era to the early 1960s curated by historian Michael Sappol. More on all can be found here.